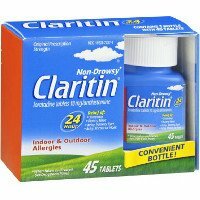 Claritin Non-Drowsy Original Prescription Strength Indoor & Outdoor Allergies Antihistamine Tablets are now available in a bottle! Loratadine tablets 10 mg. 24 Hour. Relief of: Sneezing. Runny nose. Itchy, watery eyes. Itchy throat or nose. Use only as directed. You must click on this offer to get the printed coupon.